I decided that I was going to start my shopping on the Bestsellers page of Sleek's website, and as soon as I saw this lipstick I knew that this would be the time that I would be actually placing an order with Sleek. I've recently been obsessed with purple lipcolor and this one - vibrant and matte, to boot - seemed absolutely right up my alley. I absolutely love the packaging of this item. The tube is oval shaped and actually quite small. It contains 3.5g of product, so you receive the same amount of product as most lipsticks even though the packaging is quite small. Like many other Sleek products, the tube has a black matte finish with the logo in a subtle gloss finish on the lid. It's very chic and I absolutely love pulling it out of my purse to reapply. This shade is a matte finish, but feels soft and creamy on the lips when you apply. It applies very smoothly with no tugging or patchiness and it is incredibly pigmented. Like with most matte lipsticks, I find that this is somewhat more comfortable when you apply it after a thin coat of lip balm, but even without that added step I don't find this lipstick to be particularly uncomfortable at all. Though this isn't advertised as a long wearing product, like many matte lipsticks it does have really good staying power. I've found that I don't have to reapply often at all, even though I rub my lips together constantly when I have lipstick on. Also, it doesn't get that tight, uncomfortable feeling once it sets down. The thing that I find most surprising about this lipstick is how wearable it is. It is a very vibrant colour that I would consider to even verge on neon, but the matte finish keeps it from looking overly bold for wear during the day. While purple lip colour inevitably looks amazing on deeper skin tones, I've always found that it can be a little bit difficult to find one that is as flattering on pale skin like mine. This one definitely hits the mark there for me, and I feel like it would be flattering on a very wide range of skin tones. All in all, this lipstick is a huge win for me and will probably be my signature colour this summer. 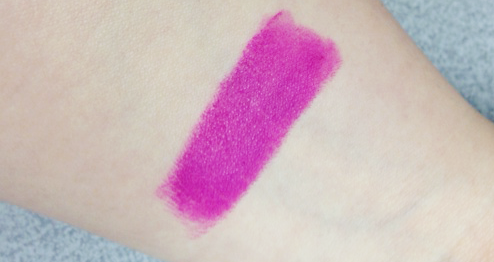 Also, I will likely be investing in a few more Sleek True Colour Lipsticks in the near future, even though I don't think I'll get as excited at any of the other colours more than this one.